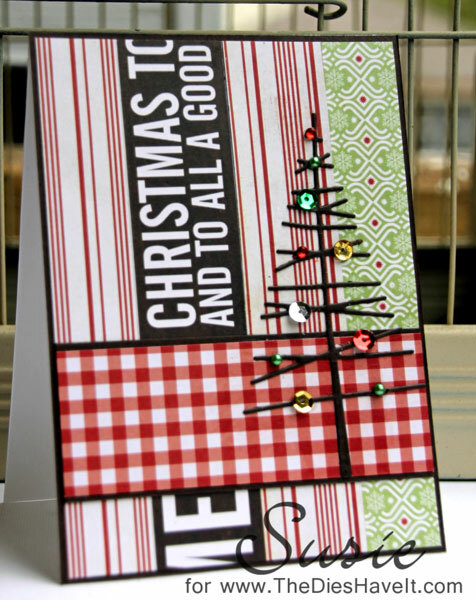 My card base is made from strips of paper from the Echo Park 6x6 Reflections Christmas paper pack. There are so many beautiful papers in this little package! But the star of this show is the die from Simon Says Stamp. It is that sweet little Mod Tree. The die cuts beautifully and the trick I found is to use Multi Medium (matte) to adhere it. You can just paint it on behind the entire tree area and when it dries, you can't see it at all. And little tiny edges stay secure!! I added some sequins and gems and I think it is the perfect little tree and the card is ready to be sent out now. I'll be back tomorrow with another Christmas card for you. 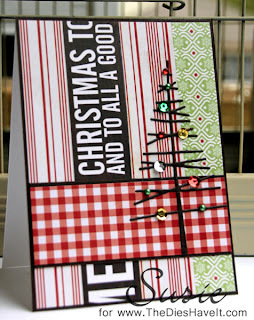 Love the strips of paper as background--great way to use up scraps, and they set off your mod tree so well. Love the Christmas tree! And I appreciate the idea of the multi medium to adhere it. Susie - the card is awesome as is the tip you gave us with the matte multi medium. Thanks! Wonderful, colorful card, Susie! Good to see you here again. Thanks for the tip with the matte multi medium -- I would have never thought about that one!